This wonderful looking lake set in the limousin region of France near Coussac Bonneval, is one of the most consistent lakes I have fished. 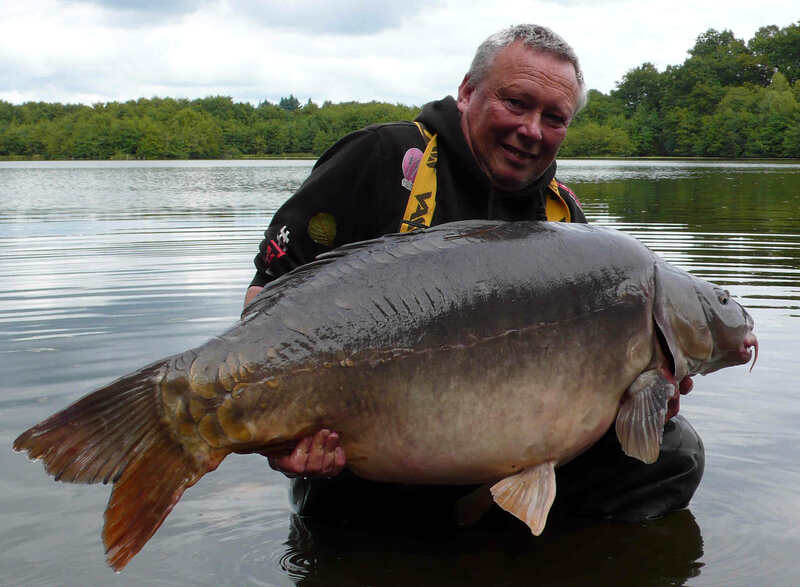 Where all swims can produce Big carp but multiple catches are possible as well. With 20 acres of water and swims well spread out over the lake you have plenty of choice for six anglers. Some swims do have platforms, so pods are needed or stage stands, but all swims are comfortable. There are lily pads dotted all round so there are plenty of features to fish but the carp do like the open water as well. Lac Serriere, and its sister lake Badgers Holt, are fed from a river with a good flow of water. Serriere is quite shallow and very silty but don’t let this put you off as the carp like to dig into the silt and root around for your baits. You are allowed to bait up using a boat if you prefer but you must use a life jacket if you intend to bait up this way. It is worth taking note that you will need to keep baiting up regularly as these carp love food and you will find the fishing quick. As for rules these are based on common sense and there is a zero tolerance of failing to comply. Do check the rules before arrival as you would not want to be caught out. 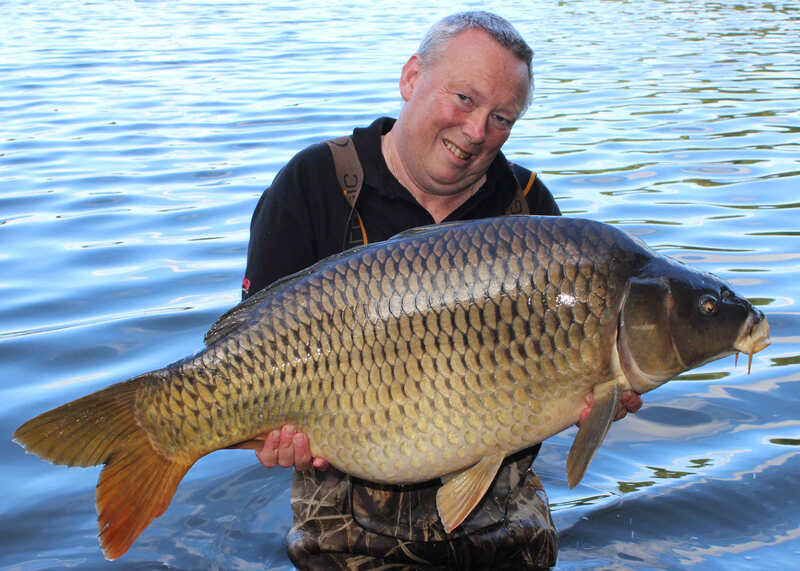 One of the most important to bear in mind is that as the carp are big, with weights to 80lbs at the right time of year and with many of the carp being over 40 lbs, photos must be taken only in the water. I have found this to be no problem as long as you have cameras and chest waders at the ready. Tactics wise – be consistent with your baiting up, as I have found the carp like to shoal up when searching for food and, as mentioned before, you can have multiple catches. If I am fishing open water, I will top up with pellet and boilies during the days which I feel is when the carp are not feeding so I can make less disturbance, I normally do this around 2 to 4 pm. When I have fed the areas I tend to leave the rods out to give the swim a rest and let the carp move in and become confident. What I really like about Lac Serreire is at some point carp will move in and you can keep them in your swim with the correct feeding. 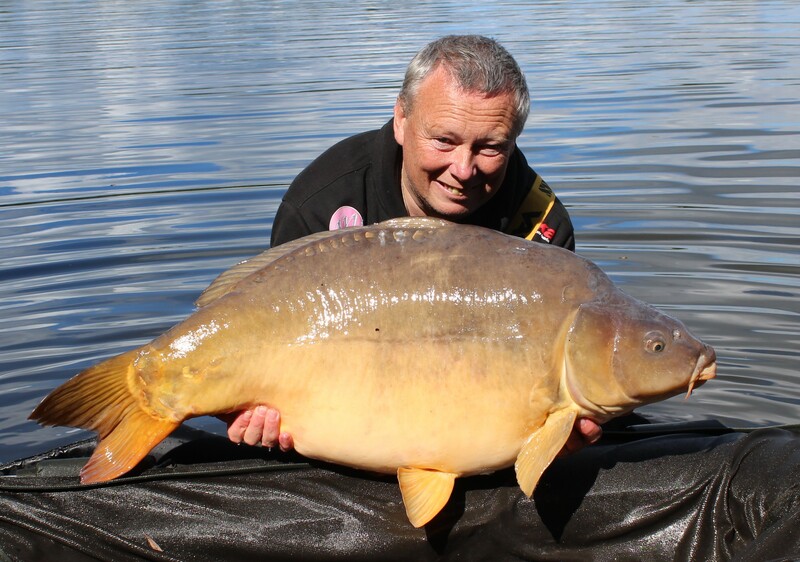 However you will need to use good quality boilies and pellet – This is crucial. I like to soak my pellet with Mainline Bait Multi-stim and stick mix liquids and adding some maize. When adding the boilies, I have some chopped up and add different sizes from 18mm to 10 mm. When out in the boat I always use a baiting spoon to give a nice spread around the markers that I will have put out at the start of the session. When I bait up near the pads I never take the boat near them as I have found there are always carp around them. To reach these spots I either bait up with a bait boat or catapult. I tend to feed regularly using small amounts as I have found the carp in these areas to be more cautious. In this situation I do like using hemp in my feed as the carp really do like to get into the edges of the pads and dig around trying to find every bit of bait. Around the lilies you will find difficult areas as the carp feed on a regular basis and have patrol routes in certain areas. Do keep a look out as they do show themselves and it is easy to work out where they likely to be. I will tend to bait up a few areas around the pads to give each bed of pads a rest. I usually bait up four areas and alternate these on different days. This has worked for me so many times. 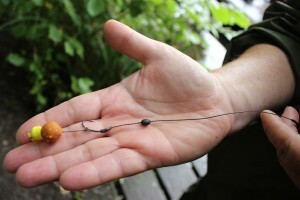 When it comes to rigs I use my favourite long hair blowback rigs tied to Atomic JEL-E-WYRE with Fang x barbless hooks. With a 14mm boilie and tip with Half a Mainline dumbbell popup. This rig has caught me many fish, so whilst I am still catching there seems no need to change. I tend to fish these rigs on atomic safety clips using 4oz square coated frank leads, making sure that when you have a take the leads do fall off making easy to get the carp out of the pads. Anglers always ask why don’t I fish pop ups to avoid the silt but I have found the carp love going into the deep silt and digging out the bloodworm, pellet and boilies. In my opinion this helps with the long hairs as my hook holds have been excellent at Lac Serriere. Simon the owner of lake is always willing help and more than happy to give advice and pass on his vast experience of tactics. He always watches the lake and really wants you to catch. Checkout the lakes Facebook page as catch reports are posted each week and this will tell you where the carp are being caught from. One thing for sure I can’t wait get back on there!